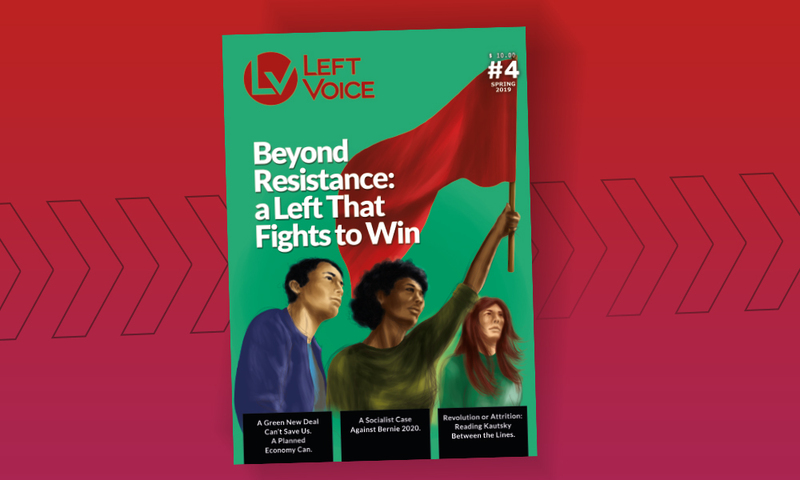 On April 29, a united left slate won a historic victory in the elections of the Sindicato Único de Trabajadores del Neumático Argentino (SUTNA – United Tire Workers’ Union of Argentina). The Negra-Roja-Granate (Black-Red-Garnet) list convincingly defeated the Violeta (Violet) list led by Pedro Wasiejko, who has controlled the union since 2000. 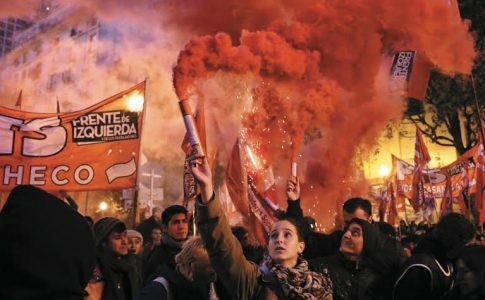 This historic victory for clasismo (working-class politics) signals the defeat of one of Argentina’s most important union leaders and the first time in decades that the Left has won national control of any union in the country. On the April 27 and 29 elections, Negra-Roja-Granate won 56 percent of the vote—enough to convincingly defeat Wasiejko and his Violeta list. Wasiejko controlled the union for sixteen years and in that time oversaw hundreds of job losses and a continual winding back of conditions. SUTNA has about four thousand members. All but a few hundred are concentrated in three firms in Greater Buenos Aires, FATE (Fábrica Argentina de Telas Engomadas) in the northern San Fernando area, Pirelli in Merlo, and Bridgestone-Firestone in Lavallol. The anti-bureaucratic list beat the Violeta by 649 votes to 217 in the SUTNA San Fernando section at FATE factory, which has been in the hands of the Left for several years. The Left also won at Pirelli for the first time by a margin of 524 to 443, while the Violeta narrowly retained Bridgestone with 384 to 279 votes. 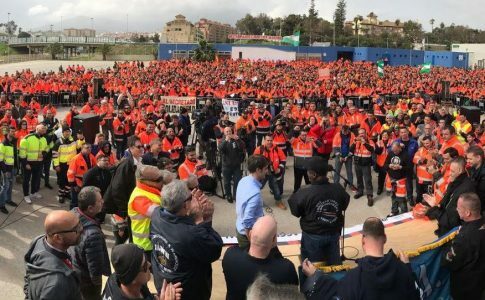 The victory of the united Negra-Roja-Granate list is of enormous importance: with it, clasismo (working-class politics) has reclaimed the national union from the bureaucracy at a time of crisis for the country’s automotive sector. The Negra list is made up of members and sympathizers of the Partido Obrero (PO—Workers’ Party) of Jorge Altamira, along with dissident Peronists. The Roja list is led by a group of workers linked to the newly formed Trotskyist group, the Partido por la Revolución y el Comunismo (PRC—Party for Revolution and Communism). The Granate list is composed of members and sympathizers of the Partido de los Trabajadores Socialistas (PTS – Socialist Workers’ Party). Until recently, Granate was part of the Marrón (Brown) list led by Jorge “Chupete” Ayala of the Nuevo MAS (MAS—Movement for Socialism), but Granate broke with Marrón after it became clear that the latter would not be part of a united anti-bureaucratic list. With these elections, Alejandro Crespo, FATE worker and one of the national leaders of the Coordinadora Sindical Clasista (Class Struggle Union Coordinating Committee—union front of the Partido Obrero) has replaced Pedro Wasiejko as SUTNA Secretary General. During his time as SUTNA leader, Wasiejko came to be hated by many unionists. His bureaucratic and employer-friendly politics led him to concede regularly to company layoffs without a fight and signoff on the suspension of workers at the bosses’ request. An agreement at Pirelli put drastic changes to the work regime in place: salaries were reduced by 20 to 30 percent and “continuous work” was implemented—with staggered shifts to keep the machinery running constantly. Work previously done at the three large tire firms has been outsourced to dozens of outside contracting businesses; hundreds have lost their jobs and workers in the outsourced jobs receive half the original pay rate. Pirelli now uses labor-hire workers who remain employed by agencies for years. Wasiejko and the Violeta list resorted to all sorts of bureaucratic tricks while in power. This was clearly demonstrated during December’s general assembly meeting, which was convened to vote for a new electoral board that would oversee upcoming elections. 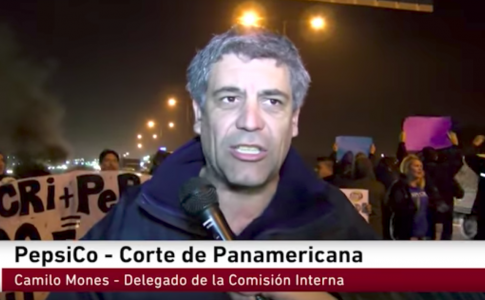 Supporters of the Violeta list proposed that Wasiejko preside over the meeting, while oppositionists wanted Alejandro Crespo from the union’s FATE/San Fernando section for this role. Despite a show of hands that suggested a majority for Crespo, Wasiejko refused to take either a count or go to a ballot, and instead simply declared himself elected. Wasiejko’s bureaucratic imposition quickly degenerated into a physical confrontation, with the oppositionists from FATE deciding that it was best to simply leave the meeting en masse. Wasiejko and the Violeta list have not shown themselves to be above electoral fraud. With the electoral board in the hands of the bureaucracy, activists warned SUTNA members of this possibility. Thus, the Garnet list’s leaflet warned that the only way to “defend transparency in the elections is by asserting your right to clean elections,” and urged all supporters to volunteer to observe the voting process, visit the various firms and workshops during elections with the opposition candidates, and mobilize to attend the vote count at the union’s national office on the final day. In the end, the bureaucracy’s tried and tested tricks were not enough to save Wasiejko this time round. The significance of his defeat at the hands of the Black-Red-Garnet list cannot be underestimated. Wasiejko is one of the highest-ranking union leaders within the Central de Trabajadores de la Argentina union federation (CTA—Argentina Workers’ Central). The CTA is currently split between one wing led by Hugo Yasky, which strongly supported the previous Peronist government of Cristina Kirchner (CTA de los Trabajadores), and a dissident wing led by Pablo Micheli (CTA Autónoma). Wasiejko is the Deputy Secretary General of the CTA de los Trabajadores, the number two spot behind Yasky. The CTA de los Trabajadores is now scrambling to replace Wasiejko. The rise of the clasismo in SUTNA that led to Wasiejko’s defeat began a decade ago with struggles at FATE. Employer attempts in 2006 to put in place different conditions for old and new employees and implement a productivity linked profit-sharing scheme erupted in conflict. Out of this struggle arose the militant Marrón list, with its use of general assemblies and direct-action methods. In 2007, Marrón won control of the comisión interna (shop-floor/factory committee) at FATE and later, the SUTA San Fernando branch in January 2008. In July 2008, the three big tire firms of FATE, Bridgestone-Firestone and Pirelli laid off over 200 workers, including 79 from FATE. Almost all of these workers were union delegates and activists. The firms’ targeted attack on these workers was a direct violation of legal protections in the constitution. The strike action called by SUTNA turned into a prolonged and combative struggle at FATE. The dispute quickly escalated—the factory and its surrounding suburbs occupied by regular and elite police units. Along with the iron fist of the police came the velvet glove of compulsory government conciliation. Both aimed to frighten the workers who still had jobs. Wasiejko eventually signed an agreement with the Ministry of Labor to accept the majority of the layoffs and just barely managed to get the agreement ratified at a subsequent general assembly meeting. It was from this point that divisions in the Marrón began to surface. Some placed the need to defend the Left’s hold on the San Fernando union branch ahead of the fight for the jobs of their sacked colleagues and the need for general assemblies for decision making. Of the dozens that were fired, only a handful of activists decided to pursue legal action. One of those was Victor Ottoboni, a PTS militant and elected delegate at FATE delegate, whose court cases dragged on for years and were only successfully finalized in September 2015. 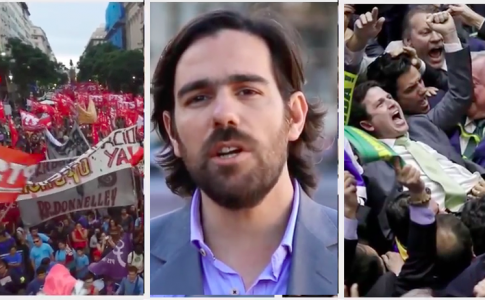 In the lead-up to the SUTNA elections of 2012, the Marrón list fell apart over the question of how to relate to a split from the Violeta list of Wasiejko. Delegates such as Marcelo Gallardo, who were previously tied to the bureaucracy, formed the Verde (Green) list at Pirelli in Merlo. The majority of the Marrón, including members of the Partido Obrero, were in favor of forming a joint list with Gallardo. This majority formed the Negra (Black) list and kept control of the San Fernando section of the union. Gallardo’s Verde and the Negra formed the Negra y Verde (Black and Green) list for the 2012 elections, with Gallardo leading the list as candidate for Secretary General. The Verde list received both political and financial support from Pablo Micheli of the CTA Autónoma, who is also Wasiejko’s factional opponent. The remainder of the Marrón list, made up primarily of MAS and PTS members, opposed the deal with the former Violeta supporters of the Verde list, and stood independently of the Negra y Verde. In 2012, the bureaucracy’s Violeta list won with 55 percent of the vote; the Negra y Verde gained 32 percent nationally and got control of the San Fernando section of the union; Marrón received 6 percent. In the months leading up to SUTNA’s 2016 elections, former Negra y Verde head Marcelo Gallardo returned to the Wasiejko bureaucracy and joined the Violeta list. This act of treachery was denounced by the Left and Gallardo’s own supporters, sealing the fate of long-term SUTNA leader Pedro Wasiejko. The coming together and subsequent victory of the Negra-Roja-Granate list was no easy matter. The Negra and Roja lists initially refused to call a joint meeting of all supporters of the various anti-bureaucratic lists to put together united lists at both the San Fernando and national level. These various lists also differ as to how representation should occur in the union’s elected bodies. As opposed to the current practice in the San Fernando section where the winning list takes all available positions, the Granate and the PTS argue instead for proportional representation. 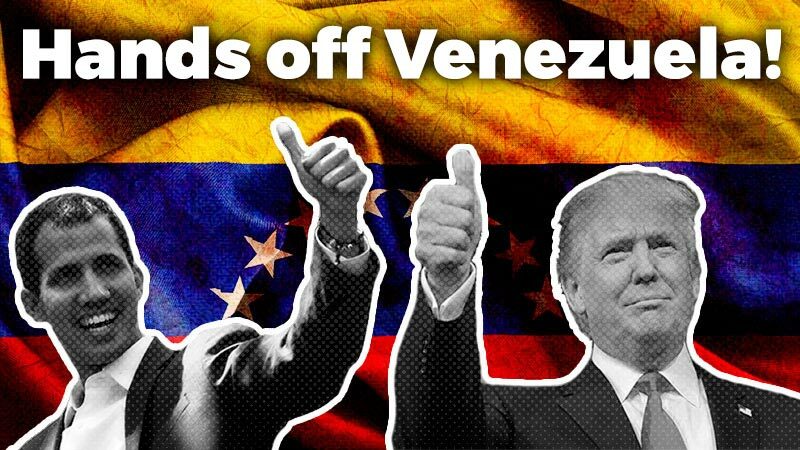 This victory is the first time in decades that clasismo has won control of a national union. It will give renewed strength to other clasismo sectors, such as those of the Bordó (Burgundy) lists standing in elections for the Sindicato Trabajadores de Industrias de la Alimentación (STIA – Food Industry Workers’ Union) on May 10 and the Sindicato de Obreros Jaboneros de Oeste (SOJO – Western Soap Workers’ Union) in June.